Available now for tax and accounting professionals, are a series of IRS CE sponsor courses. IRS continuing education courses will greatly improve your career and influence the services you provide your clients and customers. Enrolled agents are required to achieve 72 hours of IRS CE courses every three years. Most choose IRS CE courses online. Our site has become the ideal tool for IRS EAs. Maintain licensing and accreditation requirements with the webs most trusted resource. 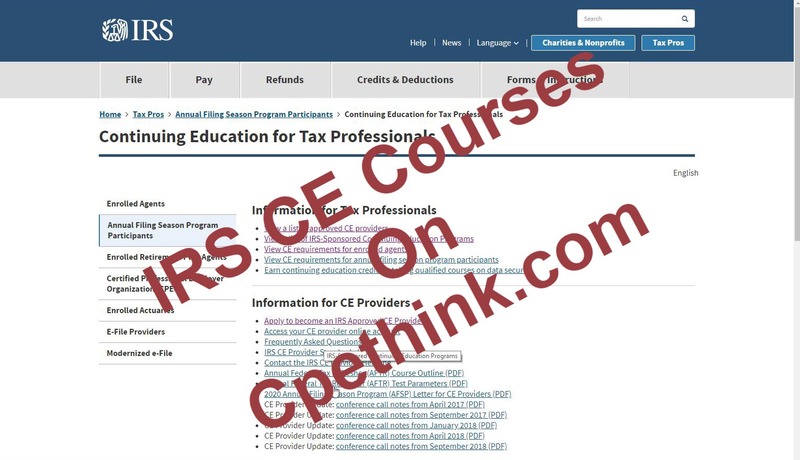 CPEthink.com provides the continuing education that every CPA and IRS Enrolled Agent needs to satisfy their required continuing education credits with their state board of accountancy or licensing agency and IRS. Explore the US Federal Tax Courses that you need to fulfill your requirements with the all-inclusive accounting IRS CE courses we provide all the tools and resources you need to stay ahead. Access your annual required courses from your computer or any mobile device. All IRS continuing education courses come with PDF downloads, online exams that can be re-taken until you’ve received your desired score, and an immediate download of certification completion directly through our website. Combining decades of field expertise and modern technology, our qualified courses will prove to be the only online resource you’ll need in your CPA career without the boring graphs and cold classrooms. Our IRS CE enrolled agent courses are self-study and developed entirely by leading professionals in the industry. This is to ensure that our students get high-end IRS EA and CPA continuing education that will give them the CPE credit opportunities that they need for acceptance in all jurisdictions that utilize the National Registry Programs (NASBA) guidelines for continuing education CPA and IRS EA credit requirements. Our continuing education online courses are run from state of the art servers, and we also have top of the line mirrored storage that will ensure no disruptions for your online CPA classes. Live chat is always available so that you can learn more about the career-altering courses we can provide and answer any questions you may have. Join the thousands of online IRS CE course graduates to enhance your skills and maintain your requirements at a pace the suits you best. Our high-quality, industry-leading course standards are designed to remain an integrated part of your career growth. Check out a comprehensive guide to our IRS continuing education courses here. According to the IRS here are continuing education requirements to maintain enrolled agent status. The renewal cycle is every 3 years based on the last digit of your social security number. Review the enrolled agent continuing education enrollment chart. Renew your preparer tax identification number (PTIN) between October 16 and December 31. Obtain 72 hours of continuing education every three years based on your renewal period. Obtain a minimum of 16 IRS CE hours per year 2 of which must be ethics. Our site and courses qualify as a required IRS approved continuing education provider and obtain all necessary courses for enrolled agent renewal. Don’t put off your annual CE requirements any longer. Register today and immediately gain access to your IRS continuing education courses. Our graduates have a stellar success and return rate and count on us to provide the necessary courses and high-value offers throughout their career. As a student seeking to fulfill the annual IRS CE requirements opting for online courses doesn’t mean you won’t have on-hand help. We have an online agent available during all business hours and a 24-hour email response follow-up. You are never on your own. Register today for our IRS CE courses. IRS EA Courses are what Enrolled Agents and Return Preparers need each year to maintain their standing with the Internal Revenue Service. We are constantly adding and updating our online IRS Continuing Education courses every week to keep up with the latest tax law and regulatory changes. Our material is some of the best in the industry. For what other Enrolled Agents and RPs have said go to https://www.cpethink.com/cpe-reviews and see for yourself. And after you have taken a course on our site let us know what you think so others can benefit from your experience with our online IRS CE Courses. Reviews are from verified purchases from customers that have completed a course on Cpethink.com.